Parliament members passed the Finance Bill 2018 in Jatiya Sangsad in Dhaka on Wednesday. The proposed budget finally got some changes, including reducing of VAT on internet service, continuation of VAT exemption on computer and its parts and increase in cigarette prices, reports UNB. Finance Minister AMA Muhith reduced the VAT on internet service to 5 percent from the proposed 15 percent. The Finance Minister exempted 5 percent additional VAT from assembling mobile phone sets. He increased the prices of 10-stick low category cigarettes from Tk 32 to Tk 35 while that of high-category 10-stick cigarettes to Tk 105 from Tk 101. Muhith also increased the tariff of per gram Jarda at Tk 1.20 while that for Gul Tk 0.60. He waived the supplementary duty from petroleum jelly considering its wide range of use during the winter by the rural and marginal people. The Finance Minister removed 10 percent supplementary duty on filament bulbs as energy bulbs are still costly for the poor and marginal people. He withdrew 7 percent additional VAT on locally produced motorcycles. Muhith increased the import duty of bulk Filled Milk Powder from 10 percent to 25 percent like previous time to protect the local milk industries. He, however, scrapped a proposal to increase import duty on Dry Mixed Ingredient, which is used as the healthy element to fill up the nutrition deficit, to 15 percent from 10 percent. The duty rate will be the same like previous year. He lowered the import duty from 15 percent to 10 percent on Unprinted PVC Sheet that is used for SIM card or Smartcard. The Finance Minister reduced the regulatory duty of double cabin pick-up 2000-3000 cc from existing 25 percent to 20 percent. Finance Minister AMA Muhith moved the bill which was passed by voice vote in the House. Before the passage of the bill, the Finance Minister joined the general discussion on the proposed budget for 2018-19 fiscal year. He said the achievement of the present government towards implementing the budget in the outgoing fiscal year is laudable. "Especially, there has been significant development on utilisation of foreign assistance." Besides, the project directors have been empowered to implement the budget from the next fiscal year, Muhith said. About the education sector, the veteran minister said allocations would be made from July 1 next for enlistment of education in the MPO scheme after withholding the system for over the last nine years. "At the same time, some allocations will be made in each area to change the MPO system while some additional allocations will be made to make new classrooms demolishing the old and dilapidated education institutions," he added. He expressed his high hope to implement the budget and achieve the target of 7.8 percent GDP growth in the coming financial year. Taking part in the budget discussion, Prime Minister Sheikh Hasina said there is no criticism about the proposed budget this time. "Through implementing this budget, Bangladesh will advance one more step," she said. She also said Bangladesh will be able to achieve 7.8 percent growth this year. Opposition bench members Fakhrul Imam, Nurul Islam Omar, Kazi Feroz Rashid, Nurul Islam Milon and Rawshan Ara Mannan, and Independent MP Rustam Ali Farazi proposed publishing the bill for eliciting public opinions. However, their proposals were rejected by voice vote. The Finance Minister moved the bill which was passed by voice vote. The bill was introduced in the House on June 7. 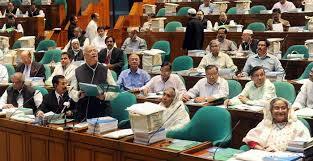 The House accepted some amendments to the Finance Bill, 2018 brought by M Shahiduzzaman Sarkar (Naogaon-2).